After Gearbox Software put gamers out of their misery at the start of the month by announcing Borderlands 3 release date, we’ve obviously seen a huge increase in everything Borderlands related. We now know that Ashly Burch who voices Tiny Tina will be making an appearance in Borderlands 3, but unfortunately, Troy Baker won’t – which was quite surprising due to the stellar job he did with Rhys. 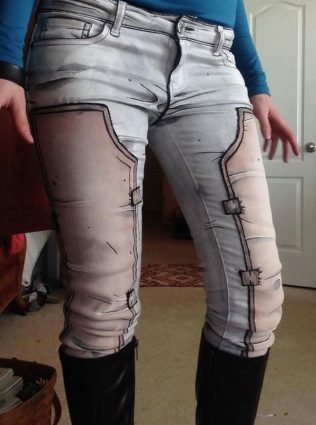 Keeping with the “anything and everything” Borderlands, how about these super cool cel-shaded Borderlands pants? 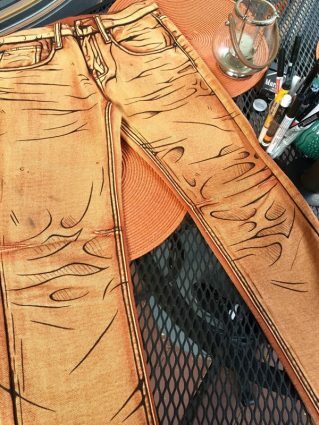 Thanks to Reddit user u/LebaneseBruh who spotted these, we can now get a look at what Borderlands clothes would look like in real life. This particular design is crafted by LMcosplays who handmake cosplays and props. The duo has created things such as a Xenomorph armor swimsuit, monster gijinkas, transforming into a host of cosplay characters, and of course, lots of Borderlands themed attire. Their work has even won them awards in various craftsmanship and performance competitions such as the New York Comic Con’s Eastern Championships of Cosplay, Baltimore Comic-Con, and RTX. LMcosplays have made some amazingly detailed items that include Tiny Tina’s wig which has been made using foam clay and flat craft foam. To craft the structure further tin foil was used to sculpt out a basic shape for the dimensional parts then covered it in foam clay. LMcosplays then cel-shaded it with different black acrylic paint pens. I think we can safely say that they managed to pull it out of the bag. You can check out more from LMcosplays via their Twitter, Instagram or Facebook page. Borderlands 3 launches on PC (via Epic Games Store), PS4, and Xbox One on September 13, 2019; the game will come to Steam six months later. You can also pre-order the three various editions via Amazon now.